Since August last year, the violence in the Kurdish region of southeastern Turkey flared up again. Kurdish youth affiliated with the PKK engaged in battle with the state police and army. The fights struck Sur, the historic centre of Diyarbakir, under siege since December. How much schizophrenia can a city cope with? In the modern district of Diyarbakir life seems to take its course. The shops are open, the streets full of people. The ubiquitous dark blue armoured police cars became part of the cityscape in the Kurdish southeast of Turkey already for years. Little points out – on a calm day at least – that some blocks further down Kurdish militants are waging a bitter war in the alleys of the old city. Until a column of tanks hurtles past on their way to the city walls of Sur. Sur is the beating heart of Diyarbakir. Thousands of years of history crammed together inside the basalt ramparts. Today, the walls have become a prison. The army and security forces have sealed off Sur from the city gates since the start of operations. A curfew has been enforced in certain neighbourhoods since 11 December. Gunshots sound from behind the walls, only to be interrupted by an occasional explosion followed by a plume of smoke. Military equipment goes back and forth between Sur and the army base a little bit further. 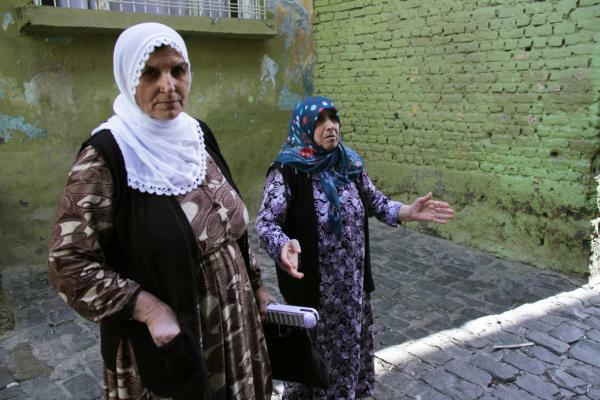 Diyarbakir is just one of the cities in the Kurdish region affected by the conflict. In Silope and Cizre, the operations of the police and army have been declared completed by government officials. The rebellious neighbourhoods in both cities are reduced to bullet-riddled ruins. Many hundreds civil deads were counted, though the Turkish government denies any civilian casualties. Since February 16 there is a curfew in place in the town of Idil, the next place to be ‘swept clean’, in the words of the Turkish government. In Hakkari, Sirnak and other small towns it comes to clashes almost every day, while in Nusaybin Kurdish youths are busy setting up new barricades. The fear lingers that once the snow in the mountains will melt away within a month or so, a major offensive by the PKK (Kurdistan Workers Party) can be expected. Thirty-three people were killed, most of them students ready to help as volunteers by the rebuilding of Kobane. On July 20, an ISIS-member blew himself up in the border town of Suruç, near Kobane. Thirty-three people were killed, most of them students ready to help as volunteers by the rebuilding of Kobane. Two days later, the PKK shot two members of the anti-terrorism police. The already fragile truce between the Turkish government and the PKK lied in tatters. But things were going in the wrong direction for some time. Already in 2013 Turkey learned about the YDG-H, an armed youth group affiliated with the PKK. The YDG-H arose from the growing frustration among the Kurdish youth about the lack of result in the peace talks and the repression of the Turkish government. At the same time, the Kurds saw how on the other side of the border, in Rojava, Syrian Kurdistan, autonomy took shape. The almost open support of Turkey to IS in their fight against the Syrian Kurds put even more bad blood. In the style of Rojava,YDG-H started to carve out “autonomous areas” in the urban centres of the southeast, fenced off with barricades. Erdogan vowed ‘to destroy them and bury them in their trenches’. Since then, the region has spiralled into all but a civil war. Residents are allowed to pass through the gates of Sur, only after a rigorous security check. Journalists aren’t, according to the order of the day. To keep the gates at the old city walls, police in uniform and plainclothes stand guard. At the first two ports I get a grim reception and get send back, but at the third gate the security services are in doubt. An officer plays with my passport, makes a few phone calls, let us go in, calls us back, but finally lets us pass. Even within the walls of the embattled Sur, residents try to keep up a semblance of a normal life. Nevertheless, the fights are close and let their ugly rumble roar from time to time. In the main street near the city wall people are coming and going. Occasionally a van with furniture passes by. Some are leaving Sur, looking for a safe haven. Other return to the neighbourhoods where the curfew has been lifted. Once in the narrow alleys of Sur, all orientation is lost at once. In this district, Ali Pasha, the fighting has stopped a few weeks ago. But the clashes can be heard heard nearby. Yet most people have remained or returned to their homes. A woman with a child in her arms tells how she fled from her home in the neighbourhood Savas to move in with her mother-in-law. There is no water and the electricity blacks out from time to time, but there is no fighting at least. ​Around the corner, a couple of kids plays in front of their home. One of them, a boy named Ramazan, has his arm in a bandaged. His father explains that they just got back from the hospital. Ramazan has been injured when an unexploded missile struck their house. Now the boy is in danger of losing the use of several of his fingers. As we speak, three old women pass by. One of them wants to make something clear. ‘Erdogan and Davutoglu (prime minister of Turkey) claim to be Muslims, but they waste the lives of others. No one deserves to die, not our young people, nor the soldiers. Every day I pray to God that he punishes hem for what they have done.’ Through her tears she tells us that this is not the first time that she witnesses this violence. Like many other people, she fled to Sur in the nineties when the Turkish army raised the villages in the Kurdish countryside in order to break the backbone of the PKK. Every alley in the maze of Sur brings new stories of violence and destruction. A group of people stands in front of a building to measure the damage. The facade is swept away by an explosion, the concrete frame is snapped. ‘We do not know who blew up our home,’ the mother of the Adebedli tells. ‘There was a barricade here raised, so it could have been anyone.’ The woman suspects a conspiracy, because she had already received an offer to sell her house, which she declined. ‘They want us out of Sur,’ she concludes. A little further on, a group of municipal workers tries to repair a damaged water pipe. An explosion has stuck a crater and broke the pipe, depriving the neighbourhood of water. But once past the workers things go wrong, very wrong. A harsh voice commands us to stop. Two men hurry toward us, wearing civilian clothes, but with a bulletproof vest with ‘polis’ written on it and a machine gun in hand. The two are members of the feared special police forces who fight alongside the army. Without much ado, we get searched. The hands of the agent tremble when he takes my passport. Clearly, the man is nervous. For let there be no doubt, despite all the rhetoric in the Turkish media, the military operations aren’t going all too well. The two might have us in their power right now they themselves are a target to a danger that could come from all sides. Waging war in the maze of narrow streets of Sur’s inner city can be a very claustrophobic experience for those who are not covered by knowledge of the terrain. Meanwhile, the two muddle on with our passports, not knowing what to do with someone who shouldn’t be there. Again, calls are made back and forward, but finally we get our documents back. It’s better not to try our luck a second time, so we return to the gate. On the way my guide translates some of the revolutionary slogans that are to be read everywhere and talks about the ‘Esedullah Team’, the ‘Lions of Allah’, an obscure armed group which has surfaced the last months. Europe angles desperately for Turkish support to stem the influx of refugees. ‘Rumour has it that it concerns a paramilitary, radical Islamic group recruited from IS-sympathisers which are fighting alongside the Turkish army. Their slogans appeared in the neighbourhoods which saw the most intense clashes.’ It are just rumour, but they do what rumours have to do: incite fear. It brings back ugly memories of the violence of the nineties, when JITEM, another paramilitary organisation linked tot the military carried out numerous human rights violations. The silence of the international community, especially the EU, can count on little understanding. Europe has been accused of turning a blind eye on what is happening in Turkey’s southeast, because it desperately angles for Turkish support to stem the influx of refugees. ‘The state visit by Merkel to Erdogan, just a week before the November elections, was simply disgusting,’ concludes my guide. The next morning, the fighting intensifies. Every five minutes, the sound of heavy explosions can be heard. At the bus stop, a group of men watches the smoke plumes rising from behind the walls of Sur. Nobody talks, but their restrained anger is almost tangible, together with a feeling of powerlessness, because every protest in Diyarbakir against the violence gets a hard beating instantly. A few days later, more than 1000 km of Diyarbakir, in a coffee house in Sisli, Istanbul. Abdullah Demirbas smiles benignly as he talks about his city, but concern shimmers through his words. For a decade, from 2004 to 2014, Demirbas held office as the mayor of Sur. During his first term, he was sacked by the Turkish authorities because he had dared to print children’s books and tourist brochures in Kurdish. Later on, Demirbas got re-elected, but got convicted to two years prison, accused, among other of ‘language crimes’. Under Abdullah Demibas terms in office, Sur started a fascinating experiment. Not only Kurdish was introduced as a language of administration, but also other minority languages as Aramaic and Armenian got a place. The reopening of the Armenian Church Surp Giragos revived the tiny Armenian community of Sur, one hundred years after the genocide. The sanctuaries of the Yezedi’s Chaldeans and Alevis were restored.